Do you ever look at the world around you and think, “How did we get here?” How did we come to live in a world with so much amazing technology? I frequently marvel at the amount of time and engineering that goes into the devices and processes we use every day. And then sometimes, we get a glimpse into the development of what is sure to be the technology of the future. The readers of this week’s issue of Science received just such a preview, in the paper humbly titled, “Restoring Voluntary Control of Locomotion after Paralyzing Spinal Cord Injury” (you can read the paper here; subscription required). The team of Swiss researchers made two cuts in the spinal cords of adult female rats—not enough to completely sever the cord, but enough to cut off major pathways for signaling between the brain and the hind legs. Then they treated the rats using drug injections and electrical stimulation of the injured segments. 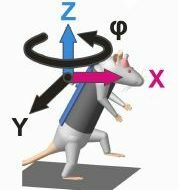 To test whether or not the rats regained any motor function, they strapped them into harnesses that allow a full range of motion and enticed to move with food. Normally, a hungry rat’s brain would send signals telling her legs to move, but since the nerves carrying those signals were cut, she shouldn’t have been able to move at all.